Shariq Textile is back one more incredible winter collection 2013. This winter dress collection is cooperation with Rabea. 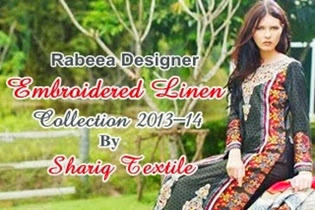 Rabea Designer is a sub brand and associated with shariq textile. Recently shariq textile and Rabea inaugurate Winter Linen Collection 2013. The collection is called "Rabea Designer Embroidered Linen Collection 2013-14". This is an amazing Embroidered Collection. The collection carry stitched and unstitched linen dresses. The collection is comprises numerous western wear and eastern dresses. Modern women and young girls are specially like these stylish, trendy and elegant embroidered linen outfits. This Rabea Designer Collection includes Shalwar Kameez, Long shirts, maxi, trouser, tights and dupatta. All these dresses are garnished with beautiful designer embroidery such as motifs work, lace work, strip work and thread embroidery. In this Rabea Designer Embroidered Linen Collection you can see all glaring and dazzling colors like black, red, grey, yellow, blue and many more. These linen prints are very sensational. This is unsurpassed winter collection of year 2013.